Last year, we had a little Halloween party for the babies we knew. All of my son’s friends were under one year old, like him, so sweets were not the best option for the party favour bags. 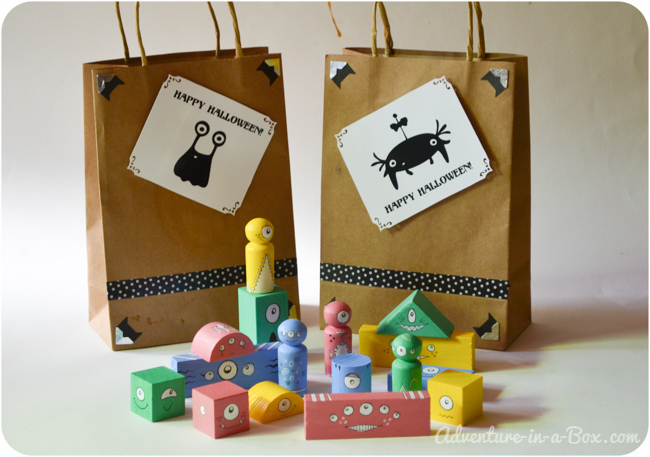 Yet, I wanted them to have something special to remember their first Halloween party later, so I made these monster building blocks. 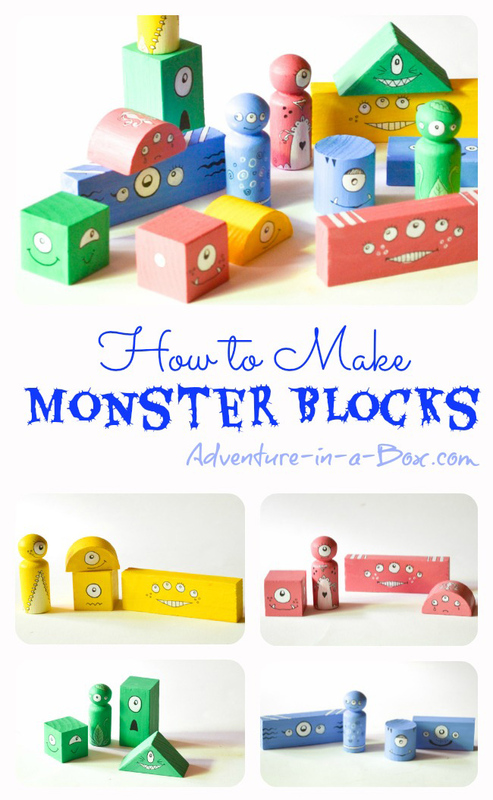 Since making these a year ago, I have thought of a few ways of making monster blocks. 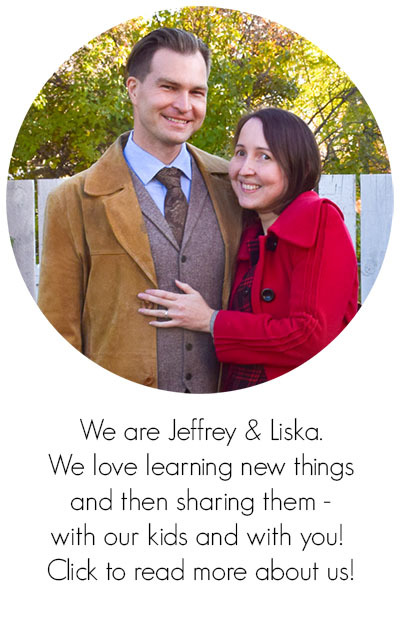 All of them start with acquiring a set of cheap building blocks. We spotted ours at a thrift shop, but this set of blocks is a good example of what would work well. 100 pieces will take you a long way: you can make monster blocks and look around for more block-based crafts! Next comes painting, and this is where you can try different variants. 1. Paint blocks with acrylic paints . The acrylic paints you will find at the stores these days are certified non-toxic, and once dry, the paint stays fairly waterproof. It might eventually start rubbing off, but before that it will endure months and months of heavy play. If you want to make it last longer, use varnish for acrylic paints . This is how I painted these blocks a year ago. 2. Use liquid watercolours for giving your blocks a stain. 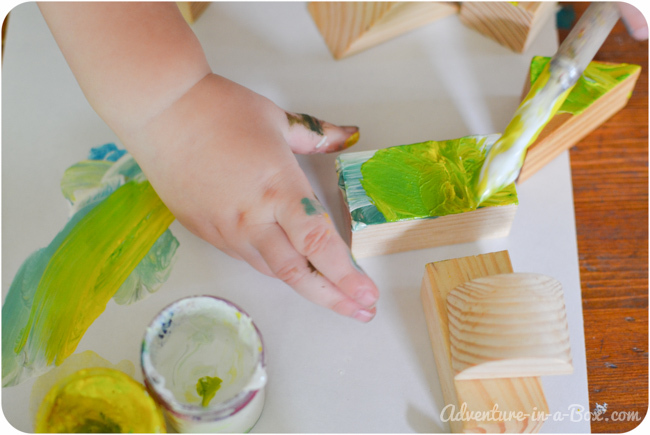 Here is a great article by Fun at Home with Kids on how to stain your blocks with liquid watercolours. 3. 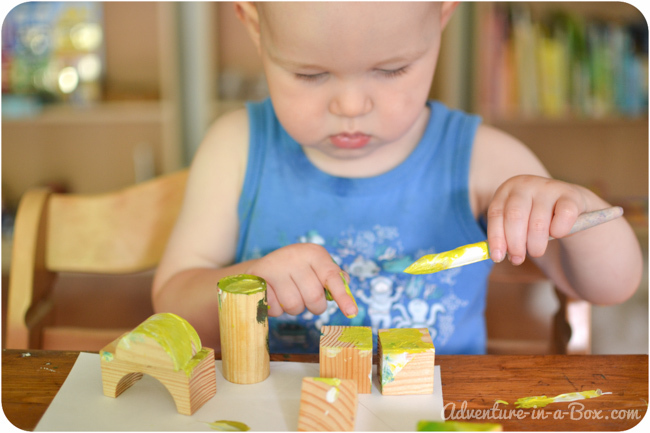 Paint your blocks with tempera or gouache paint and seal them with varnish that is not water-based. Last year Budster did not participate in the project, being ten months old at the time, but recently I offered him to have a go at the blocks. We hope to make more monsters soon! They will sure have an interesting texture. No matter what paint you use for the base coat, for the actual monster faces I recommend white acrylics and ink pens. Sakura ink pens are my favourite for when I need to make black lines of different thickness, but Sharpie markers with fine tips will work well too! Now, coming up with faces is the fun part, and children will have a blast, making their own monsters. I did not want my monsters to look scary, so the only things that made them look monstrous were occasional fangs and an unusual number of eyes. None of them were angry or evil – they were happy, ironic, mischievous, surprised and sometimes sad. Finally, the monsters were packed into the Halloween bags, and then went to live with their new owners. We could not part with all of them, so a few stayed at our place. 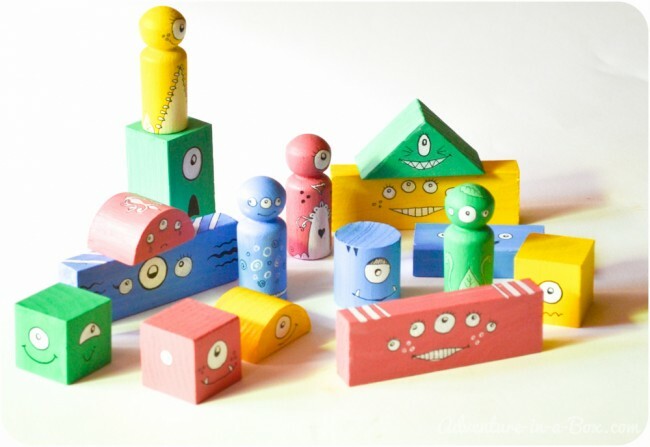 They are a very well-behaved bunch, and Budster likes to include them into his building block games. 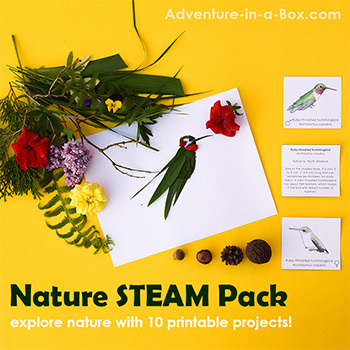 If you want to stay updated on new stories from Adventure in a Box, consider subscribing to our Facebook, Pinterest or Instagram pages. 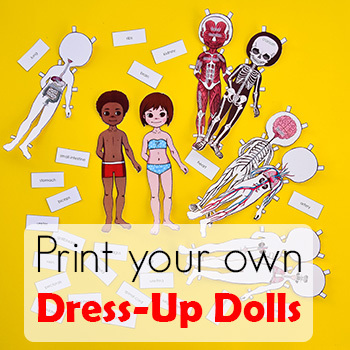 You may also be interested in exploring the Pinterest board below for more fun Halloween ideas. 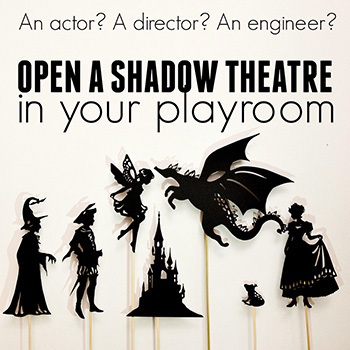 Follow Liska – Adventure in a Box’s board Halloween Ideas on Pinterest. Wonderful idea! 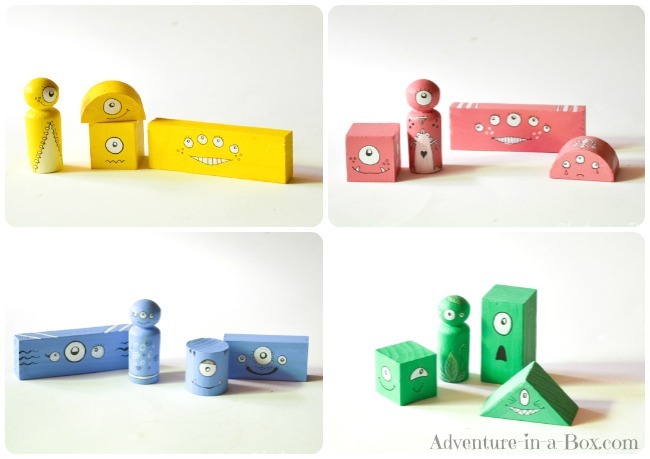 They are delightful and I’m sure kids will love to play with them.